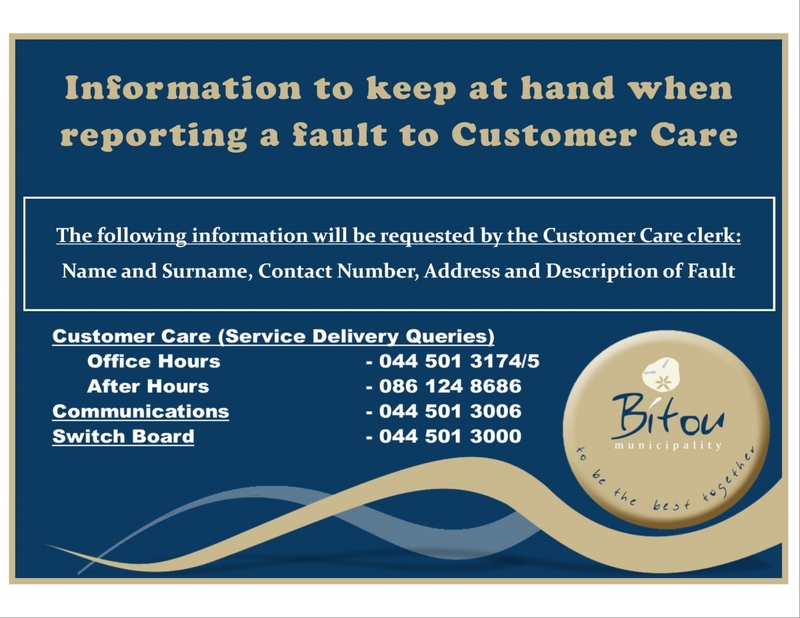 Bitou Municipality Customer care involves putting systems in place to maximise our customers’ satisfaction with our business. It is a prime consideration for every business – our profitability depends on keeping our customers happy. Customer Care Department is there to act as an intermediate between you, our valued customer. Our Customer Care consultants have undergone extensive Customer Care training to ensure that they are able to assist you we strive to deliver excellent service to both our internal and external customers. Our Customer Care department can be contacted on 044 501 3174/5, and we will respond to your query within 24 hours. You can fax us on 044 533 3485. The municipality consists of various departments which are responsible for their own field of expertise. Due to the shortage of adequate office space these municipal services are decentralized. Therefor the Customer Care Call Centre is the one central point of contact with the municipality which can bridge the gap in ascertaining which department can best assist in any situation.